to the front of the walker. 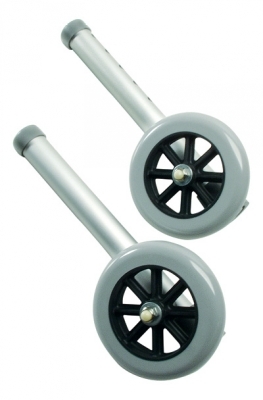 Recommended for use on the rear legs of the walker when fixed or swivel wheels are used on front walker legs. 300 lb maximum weight capacity. Designed to meet the requirements of HCPCS code: E0155. Attractive retail packaging. Limited lifetime warranty. Kits of AutoStop Wheels and 3" or 5" fixed wheels also available.